Every summer the tussocky forest floor becomes decorated with the pink and magenta spires of native Hyacinth Orchids (Dipodium punctatum). Every other year I have seen only solitary spires, and mostly that is so this summer, except for this clump of four. Their combined pinkness was so noticeable from a distance that it drew me to investigate. 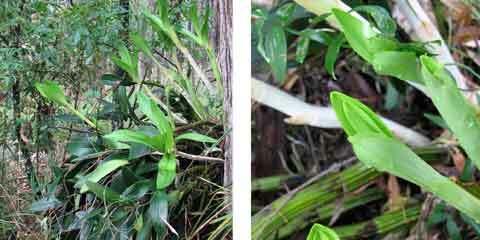 Closer to the cabin, my rescued and relocated clump of indigenous King Orchids (Dendrobium speciosum) did not flower at all this summer. Instead it seems to be putting all its energy into fat new leaf shoots, about a dozen in all, stretching up and out of their papery white sheaths. I especially like the way the small pale green mouths first open, like baby birds, tongues ready to lap any moisture that falls. Their timing is perfect since we have had rain, and an extreme drop in temperatures — from 30ºC one day to 15ºC the next.